Art and science have long enjoyed an intertwined history, with artist's materials often just a heartbeat removed from the chemistry set. And while highly toxic art supplies (solvents, thinners, etching acids) have largely fallen out of favor, the options available to artists seeking new frontiers haven’t exactly narrowed — if anything, they’ve broadened. 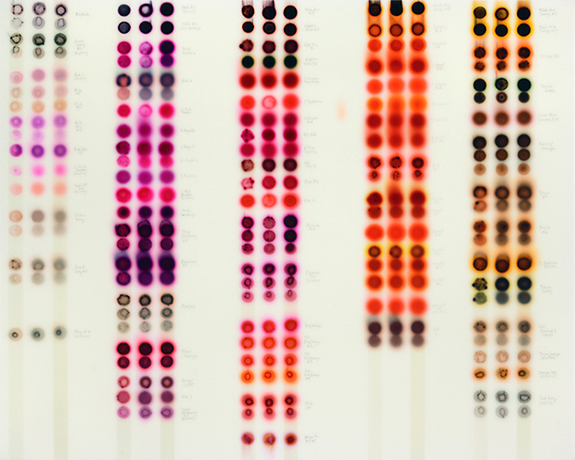 For proof one need only take in the work of Jaq Chartier, a Seattle artist whose current show, In Solution, runs through June 2. For the past 20 years she’s carefully researched how inks, dyes, spray paints and resins interact with a variety of substrates. The epiphany that set her on this course of experimentation came when she realized, while working for a fine-art paint company, that color-test diagrams could, in fact, be works of art. Today, Chartier uses an eyedropper to apply the above-mentioned liquids to carefully prepared grounds. She coats them with layers of white spray paint and resins and then waits for the emergence of the obscured colors, which appear as fuzzy, elongated oval-shaped stains or dyes bleeding through to the surface. 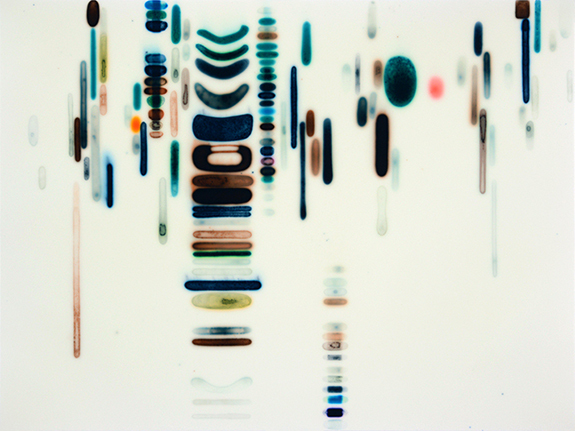 Chartier orchestrates compositions in linear arrangements that share the visual characteristics of DNA gel electrophoresis, the laboratory process in which electric current is used to separate the elements of DNA samples according to their molecular weight. For Blues Chart with 8 Whites, a large diptych, Chartier divided each panel into eight horizontal bands with narrow, lozenge-shaped marks following the same pattern in each row. A vibrant, electric blue anchors the left image, in effect forming a stripe down the center. That hue repeats on the right, but is dispersed. On the side of the panel she scrawls faint annotations in pencil: “Kvy maxx Br. Wh. Sat.,” “Rust heat,” “Kxycm51502” – indicators of the meticulous research undergirding her practice. In this, one senses the strong influence of Joseph Albers who conducted similar color experiments, albeit with notations placed on the versos of his paintings. The shapes that comprise BG/Brownfloat like shards of a mobile. They suggest chemistry and scientific inquiry, but just as insistently call to mind totemic markings. Winter Chart (15 Whites) is a medium-scaled diptych, and a particularly satisfying work, in warm hues—magentas, oranges, pinks and violets—juxtaposed with flickering bright greens and blues; a full, gem-like spectrum of color activates this work while paler, earth-toned shapes interject a muted, slightly figurative note. The irregularity and faint quirkiness of it all fire the imagination. Violet~Red~Brown, consisting of five vertical columns, each comprised of three rows of dots, carry annotations such as “Orange/BG(dilution),” “Test Gray (12/7/17),” “Plum/Flamingo.” The individual spots generally have a central core, a ring of more concentrated pigment, surrounded by a halo of color that becomes more diffuse, feathering out until it blends seamlessly into the ground. The most intense spots, however, have a broader, more uniform core. As you try to bring them into focus, shimmering after-images, possibly the effects of complimentary colors, appear. The intense hues, coupled with the challenge of trying to pull the shapes into focus, make for an optical workout. With its grid structure, Chartier's work relates to a broad spectrum of geometric abstraction and Minimalism. The subtle, poetic squares of Agnes Martin, the stripes of painters like Frank Stella and Kenneth Noland and the resin-based painting of Markus Linnenbrink all spring to mind. The lack of a quantifiable goal ultimately subverts the scientific air of the project. What you see is instead a purely visual investigation into the behavior of specific, individually selected materials as they are subjected to a sequence of physical and chemical manipulations. Jaq Chartier: In Solution @ Dolby Chadwick Gallery through June 2, 2018.